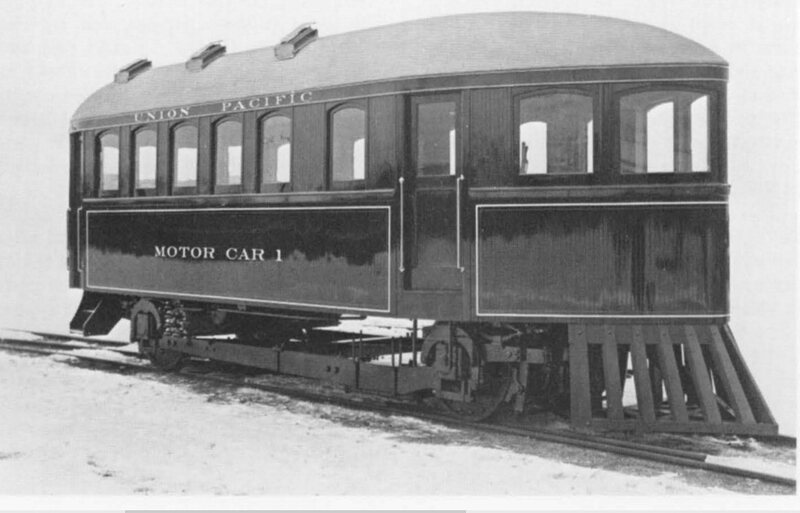 Union Pacific Motor Car #1 (Article) | The McKeen Motor Car Website Union Pacific Motor Car #1 (Article) | The Compendium of Knowledge on the McKeen Motor Car Company, and their experiments. 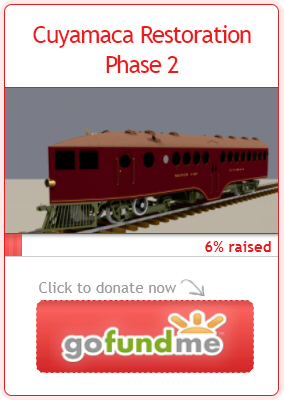 The Union Pacific Motor Car #1, which is in actual operation, has thoroughly demonstrated how practical the gasoline engine is, when used as a transportation medium. The engine was manufactured at the Union Pacific shops in Omaha. A single 4 wheel truck is used for light branch and interurban passenger service. The wheels are 42 inches in diameter. The car is 31 feet in length, and has a seating capacity for 25 persons. The weight of the car is just over 20 tons. The design of the car body is similar to that of a racing yacht. Inverted, the front end being tapered off into a sharp point, and the roof rounded off from the top, presenting no flat surface to the resistance of the atmosphere. The rear of the car is rounded off, avoiding the vacuum produced by square ends. The roof of the car, with old style “sash” ventilators, have been done away with. Adequate ventilation is now secured by means of new style roof ventilators, which exhaust by pulling the air from inside the car, with fresh air being taken in from the front roof area of the car. A complete change of air can be obtained every four minutes, if desired. This avoids the stuffy conditions so often encountered in electric and other transportation cars. The floor of the car has been made entirely watertight and can be easily and thoroughly cleansed by flushing with hot water, destroying all germs and disease. The car can therefore, be kept in a thoroughly sanitary condition. The hot water from the cylinder jackets of the engine, is piped around the sides of the car, so that in cold weather the heat is radiated to the interior of the car. In warm weather this water is piped to coils immediately below the car. These two systems of coils afford a most perfect system of regulating the temperature inside the car. If the car is to warm, the water is circulated below the car. If the car is in need of heat, the water can be circulated through the interior coils. Acetylene gas is used for the headlight, giving a very bright beam. This gas is also used to light the interior lamps, with the opalescent shades providing a soft yet powerful light through out the interior. A direct air brake system is used on all 4 wheels. An air pump is attached to the crankshaft, which supplies and maintains 100 pounds of air pressure to two 13 cubic foot reservoirs. At a speed of 20 miles per hour, tests have shown that the car can stop in a distance of 112 to 115 feet, without inconvenience to passengers. The air pressure is also used for starting the engine. In addition to the air brake system, the car is also equipped with a ratchet lever hand brake. The car, as built, is very strong, affording great safety to passengers in case of accidents or wrecks. The strength of the car almost entirely precludes the possibility of telescoping. In addition to its efficiency, the car is a model of construction, and with its coat of maroon paint and aluminum striping, giving it a beautiful appearance. The interior finish is of paint and varnish. The motive power is a six-cylinder gasoline engine rated at 100 horse power. The cylinders are 8×10 inches, of the upright type, placed at right angles to center line of the car. The six cylinders are arranged and connected in opposed sets of three cylinders, resulting in three power-giving pulsations at each revolution of the crank shaft. Engine speed has a wide range of control, thus affording great economy under any variation of load. A synchronizer facilitates and simplifies the changing of speeds. Reverse throttle and spark levers are all conveniently located and in easy reach of the operator. Immediately in front of operator is the air brake valve lever, and the emergency spark cut-out, which enables the operator to stop the engine and apply full brake power in less than half a second. Spark current is furnished by an eight cell battery, with a ”make and brake” spark device. The clutches and controlling devices are all mechanical and of the simplest design. Special effort has been made to do away with the complicated machinery ordinarily used in utilizing gasoline power for propelling cars of this kind. A special drive chain connects the engine drive shaft to the driving axle. The car is intended for service on 4 per cent grades with frequent stops, and is therefore at present, geared to a maximum speed of about 35 miles per hour, but with slight changes it could be very easily speeded to 60 miles per hour. The acceleration of the car from a standstill to 300 feet is superior to any electric car of the same horse power. The acceleration for the first 50 feet is much slower than an electric car; however from 100 feet on, acceleration is very rapid. On level, or a 2 per cent grade, the car starts readily on high speed, directly connected, without the use of gears; although on anything over a 2 per cent grade, or with a heavy trailer, it is necessary to use the gear speeds. It is easily controlled by one operator; can be stopped and backed up at will, although it is designed to run in one direction. The vibration and noise of the engine has been almost entirely eliminated; in fact, when car is in motion neither the vibration or the noise from the engine can be felt or heard. The exhaust from the engine is silenced by the muffler, with the burnt gases escaping at the rear of the car without any inconvenience to passengers. Car No. 1 was completed and turned out of the shops during the last week in March, 1905. Before being tested in actual road service the car was operated and thoroughly broken in around Omaha shops and vicinity. During these tests, the motor car was coupled to two passenger cars, a standard mail car weighing 52,100 pounds and a standard coach weighing 60,000 pounds. These cars were successfully started and accelerated, both on a descending grade and on a one-third ascending grade, the motor thus starting a total load of 152,100 pounds. Pulling a standard mail car weighing 52,100 pounds, the trip was made to South Omaha and return. This is up a 1.6 per cent grade, which was ascended at the rate of 11 miles per hour, the total load pulled being 94,000 pounds. In another test the motor car successfully ascended a sharp grade of 7.8 per cent, or about 400 feet to the mile, the car being stopped and started repeatedly on the grade. On April 2, 1905, the car was given its initial long distance run. Leaving Omaha at 10:00 a.m., the run was made west to Valley on the main line of the Union Pacific railroad, a distance of 34.8 miles, and the performance of the motor car was most satisfactory, especially on the return trip, when the schedule for passenger trains was easily maintained. On April 10th, a second test trip to Valley and return was made. The entire run —both east and westbound— was done most of the time at high speed. April 16th, the car was sent to Grand Island, Neb., and made the entire run of 154 miles in a most satisfactory manner. April 17th to the 22nd, inclusive, the motor car was in regular service on a branch line between Grand Island and St. Paul, Nebraska, making two round trips, or 89 miles, each day. On April 23rd, the car made a run from Grand Island to North Platte, a distance of 135 miles. And on April 24th, a run was made from North Platte to Denver, 278 miles, without delay other than meeting trains, or delays for orders, etc. April 26th; the car made a round trip run from Denver to Brighton and return, a distance of 42 miles. April 27th to 29th car was in regular service between Denver and Greeley, making one round trip of 107 miles each day. April 30th car ran from Denver, Colo., to Laramie, Wyo., distance 164 miles Leaving Cheyenne, the ascent of Sherman Hill, the summit of the Rocky Mountains, was made, the 27 miles of steep grade being accomplished without difficult. On May 1st, the car left Laramie for Salt Lake City, arriving on the morning of May 4th. Since leaving Omaha on April 16th, it has traveled entirely under its own power, a distance of 2,095 miles, and the performance of the car has been most satisfactory in every respect. On May 19th it arrived at Portland, Ore., its destination, to go into regular service. It should be stated that the car has required some slight running repairs, and has not been out of commission since starting on its journey.